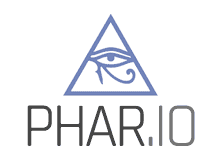 Installation and verification of phar distributed PHP applications has never been this easy! Adding all the required tools like PHPUnit, PHPMD and phpDox in their matching versions to a project used to be a lot of repetitive work: Started by finding the download URL, figuring out what the actually correct and matching version is followed by verifying the SHA1 and GPG signatures and making the archive executable. And of course you’d have to repeat this very thing for every tool needed. Alternatively, you could have used composer. Only to clutter your project’s dependencies with the ones of your tools. And fight their potential dependency conflicts. No more! Now you can rely on PHIVE to install and manage your project’s tooling needs without all the hassle and without cluttered dependencies! Installation of PHIVE is easy and about the last time you have to do anything PHAR related manually. PHIVE is still under heavy development. Please report any issues you find! Yours missing? Let us know! PHIVE and PHAR.IO are open source projects released under the BSD license. You are welcome to join the development team!